When arranging a meeting with a recruitment consultant or a careers coach, the question is often posed “is there a difference?” and if so “what is the difference?”. After spending the past 20 years as a recruiter and learning through a practical approach about jobs and recruitment, in 2018 I embarked on a four-year MA journey to learn more about the wider world of careers and stepped into the careers coaching field. I will be honest, when I started at the University of Warwick, I thought I would be adding the theories to the practical careers work that I already do, and that is true, but it has also turned my world a little upside down. The job of a recruitment consultant is slightly varied but the general expectation when meeting a recruiter is to meet an industry expert. A recruiter who understands the job market you are searching in, a specialist who has real-time knowledge of the current availability of jobs, in the required location and sector, and be able to advise of salaries, packages and career development opportunities available with the various employers compatible with your skills. The recruiter may also be able to offer advice on writing your CV and preparation for an interview. 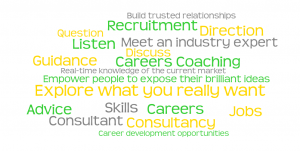 So, what does a careers coach do? Here comes the “turning our jobs on its head” bit! “You are being paid to give careers advice, I want you to tell me what the market is and what my options are”. How do I identify if I need a recruiter or a careers coach? Ask the question “do I want to explore my career options or be told what jobs are available for me?”. If you want to have direct information given to you then engage a recruiter with proven experience within your chosen field. If you want to explore your career further, arranging a careers coaching session could prove enlightening. What can I expect from a careers coach? Be prepared that the first meeting will be to explore your thoughts about how careers coaching works and for the coach to explain their experience and skills. The aim is to set the scene and set expectations of how their coaching sessions will work. This is a time for you to start to build the relationship with your coach and decide if this is the right approach for you. If this all feels comfortable and agreeable, then further sessions can be set. When working with a coach you will be asked lots of questions, you will be the one talking the most, your coach will listen, ask more and most likely you will have discussions exploring your career. When it works well you should leave a coaching session feeling you do have answers but rather than being given information you will have explored and identified options for yourself. Dependent on your personal circumstances, you may have partial answers and could have agreed with your coach areas and ideas which need further exploration and actual information. A coach can and will offer information and advice but only when agreed and appropriate. You should leave your coaching session feeling positive and possibly empowered for future steps with your career. Considering a career move, to explore what you really want. Facing redundancy. Your employer may offer an outplacement service which can include 121 careers coaching sessions. Returning to work from parental or care leave, considering different options which could be available: job roles, industries, self-employment, hours of work. Feeling uncomfortable in your current role but exiting that business is not your desired outcome. You want to throw caution to the wind and explore anything! In summary, when I am in recruiter mode, I offer more advice and guidance and get on and do! When I am coaching, I ask lots of questions, listen lots and aim to empower people to expose their brilliant ideas, because that’s what they are – their ideas, normally just hidden from their own view.